The Fortishred 3250S Strip-Cut Shredder is part of an innovative new commercial shredder line from Fellowes. Featuring a safety capacity sensor to help prevent paper jams, a blade shield for safer maintenance, and an energy-efficient automatic shut-off, these shredders are top-of-the-line. Able to shred up to 30 pages at a time, the 3250S also shreds CDs/DVDs, credit cards, staples, paper clips, and more. And with Fellowes' SilentShred technology, you'll barely hear a thing. 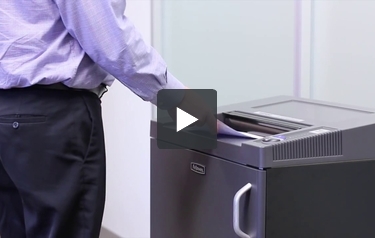 The 3250S is a TAA Compliant, Level P-2 commercial shredder intended for multiple users and continuous use. Each shredder is equipped with a 26.5 gallon removable basket for easy waste disposal. Every purchase includes a 2-year product and service warranty. Product number 4617101.